AstraZeneca wounded but definately not out! Perhaps you are sitting in front of your computer wondering how to cope with the ongoing economic uncertainty and financial strain. Take a moment and think of all the things you would do if you had several hundreds or even thousands of extra pounds per month - and were worry free concerning your retirement. I am sure you came up with plenty of options how that money could be used. Maybe you already have your money invested somewhere. But ask yourself this question - is your money working hard enough for you and are you seeing the return that you want and absolutely need to have on that investment? Today the case for investing in inflation beating dividend paying shares is as strong, if not stronger, than ever. Today, base rate stands at 0.5%, and inflation at 3.4%, still well above the Bank’s 2% target. Anyone holding cash is likely to be subject to a negative return after accounting for inflation. Fortunately, some of the UK’s best companies are offering dividend yields of up to 7.5%. Clever investing in historically undervalued companies, with long track records of increasing dividends, at the right time can be one way to help resolve your financial investment dilemmas. “historically undervalued” (using a share’s dividend yield as the primary measure of value, investors will learn to buy and sell when dividend yields instruct them to do so) thereby maximising total real return. The reasoning behind real total return appeals to us as long-term investors as it deals with averages – an average dividend yield, average dividend growth and average annual share price appreciation. We cannot be sure that dividends will rise in each and every year. We also cannot be sure when and to what extent share prices will rise. However if we can buy a high quality dividend paying share at historically undervalued price levels, and, if this company has a long, uninterrupted history of dividend payments and of frequent dividend increases over a period of years, we can be pretty sure that the total return on that investment is likely to outperform the total return on any other kind of investment. Our focus on total real return from high quality dividend paying shares could therefore help you to stay ahead of inflation, but also increase your real wealth over time. You don’t need to wonder any more about what your next financial move will be. With the Guide to Dividend Investing, you will know exactly what to do and you will see the results of your investment strategy, without having to worry or spend thousands of pounds using a financial advisor. 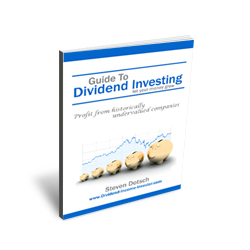 Order the Guide to Dividend Investing NOW so you can take the guesswork out of your investment decisions. AstraZeneca wounded but not out! There is no way around it; AstraZeneca announced dreadful first quarter results. First quarter revenues came in well below market expectations,falling 11 per cent to $7.35bn, short of consensus forecasts of $7.95 billion - the average of 21 estimates compiled by Bloomberg. Pre-tax profits fell a massive 38 per cent to $2.05bn, with earnings per share also down 38 per cent from $2.08 to $1.28. The company highlighted challenging market conditions together with the anticipated impact from the loss of exclusivity on several brands behind the fall, which is exactly what many analysts have been fearing for a while as the benefits of some patents have come to an end, whereas there is currently nothing much to counter this. Nevertheless, AstraZeneca remains strongly cash-generative thanks to its multi-year cuts strategy. It also has promised to return value to shareholders through a progressive dividend policy and share buyback programme. Also, AstraZeneca has not cancelled its intention to increase the dividend while maintaining cover at two times (50% of underlying earnings). Its dividends have been well covered by earnings in recent years, so, while the company is one of few FTSE100 listed companies with substantial net cash, and, with earnings per share stagnating this year, at best, there is a good chance the dividend for 2012 will not be cut.